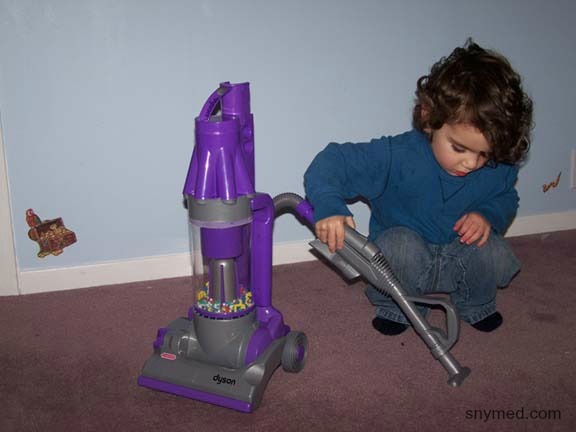 My very first experience with the Dyson vacuum cleaner company was 7 years ago, when my now 10-year old son was only a 3-year old toddler. He was obsessed with vacuum cleaners, and spied a toy Dyson vacuum cleaner that was free with the purchase of a regular Dyson vacuum at Best Buy. The day he saw the toy Dyson vac, it took me over an hour to get him out of the store! Then, we could not bypass Best Buy without him wanting to spend time pretending to vacuum with the toy Dyson! Back to the story: I called the Dyson company to see if I could purchase that same purple, toy Dyson vacuum cleaner. And to my chagrin, they were not sold separately. However, the extremely nice Dyson customer service representative sent the toy Dyson to my son as a gift! When it arrived at our house, he was flabbergasted and could not believe it was the same toy Dyson as the one he had played with at the store! It even sucked up small scraps of paper. And henceforth, my son and the Dyson were inseparable. Almost a decade later, and my son still brings up the toy Dyson that he used to play with; he wishes that he still had it. I recently had an opportunity to host a party for my nearest and dearest friends--with vacuum cleaners! The premise of the party was to measure how the Dyson V6 Absolute compared to my regular vacuum cleaner. Of course, there were awesome tunes, spontaneous dancing, and great food. You can see the Dyson V6 Absolute unboxing video I made on Instagram, above. I shopped for the party, including ingredients for my famous cherry cheesecake (whose recipe I will share in the near future). As I prepared the food, the kids strung up balloons and did a pretty nice job of decorating. 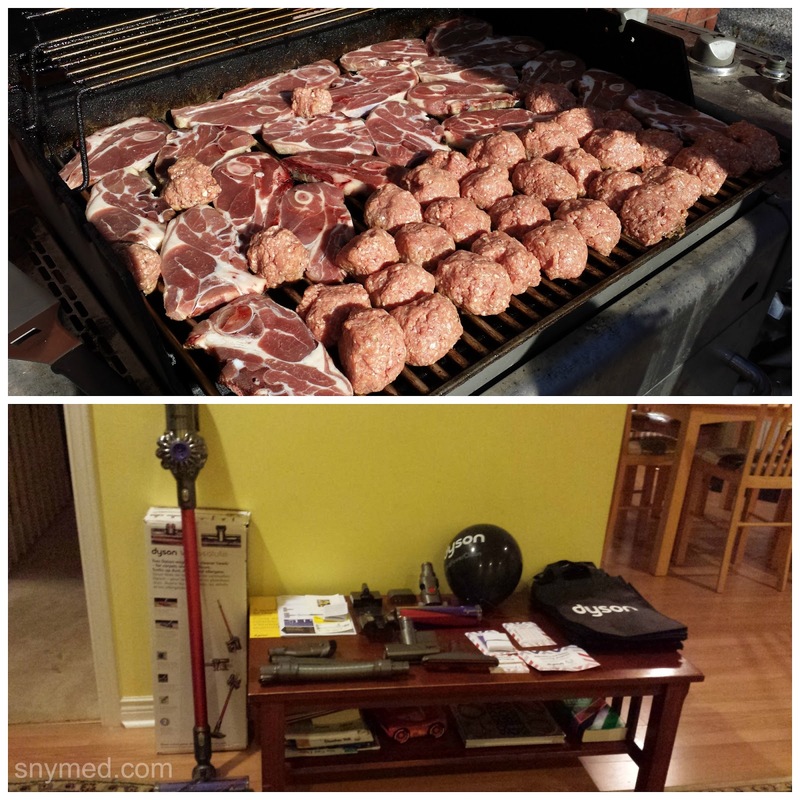 Once I got the food on the grill, guests started arriving and getting a feel for the Dyson. Some of the comments I heard included that the Dyson is so lightweight, and that they could not believe that it is a cordless vacuum cleaner (just charge in between uses). Actually, watch the video below to hear the comments for yourself, and see how the Dyson performed against my usual vacuum cleaner! VIDEO: The Dyson V6 Absolute VS. My Regular Vacuum Cleaner! In between dancing, sharing laughs and having nibbles, the ladies tested the Dyson V6 Absolute against my regular vacuum cleaner. 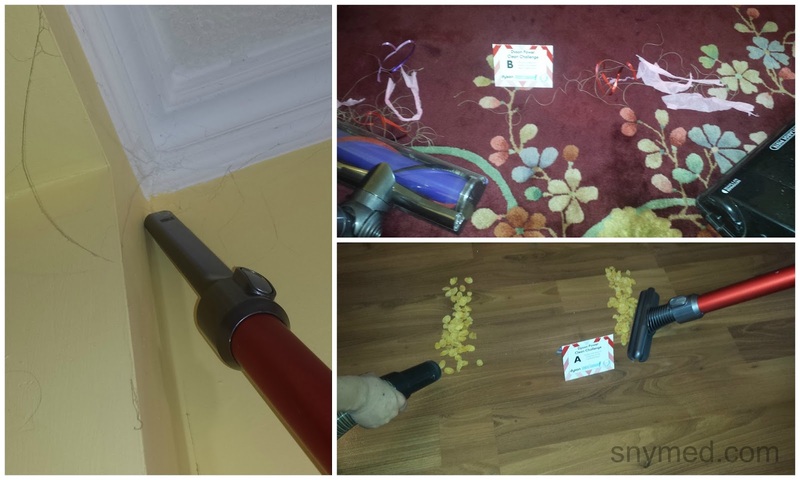 Some of the challenges they performed included vacuuming up dry cereal off a hardwood floor, sucking up ribbons from the rug, cobwebs from the corner of the ceiling, and vacuuming under a chair. Throughout the challenges I repeatedly heard the ladies say how surprised they were by the Dyson's power, and how well it swivelled and turned on a dime. 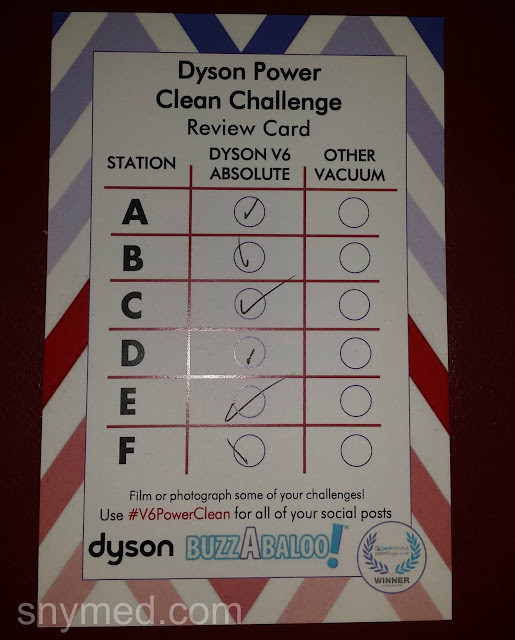 Take a look at how the Dyson V6 Absolute compared to my regular vacuum cleaner. If you watched the video above, the results are hard to argue with. The cordless Dyson did a better job at cleaning, and a much faster job too! 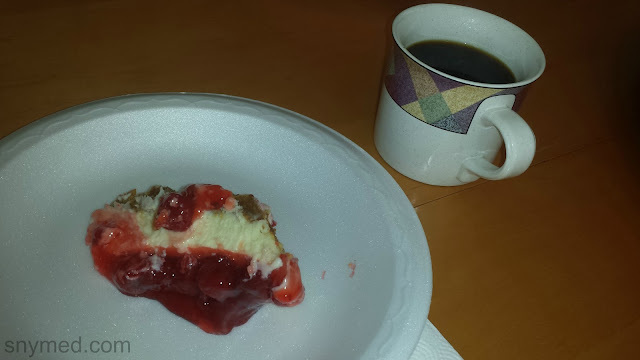 Then it was time for my famous cherry cheesecake. As usual, there was not a crumb left on anyone's plate and it was very well-received. Lastly, it was time for lootbags as the party drew to a close. As my guests prepared to leave, I got not one but two requests to take my Dyson home to try out some more. Nice one, guys, but take your hands off my Dyson! Do you own a Dyson vacuum cleaner? Are you satisfied with the vacuum that you're currently using? This Dyson model looks as though it really got the job done! You and guests looked as as though you all had a great time learning about this vacuum! Your cherry cheese cake also looks so scrumptious! I do own a Dyson now. I reviewed one and was able to give one away recently. It is a massive hit and I am sure the lucky winner was thrilled with it as well. Yours is a completely different model than mine. Mine is an upright and it is substantial in weight but it is a workhorse! That part I love. 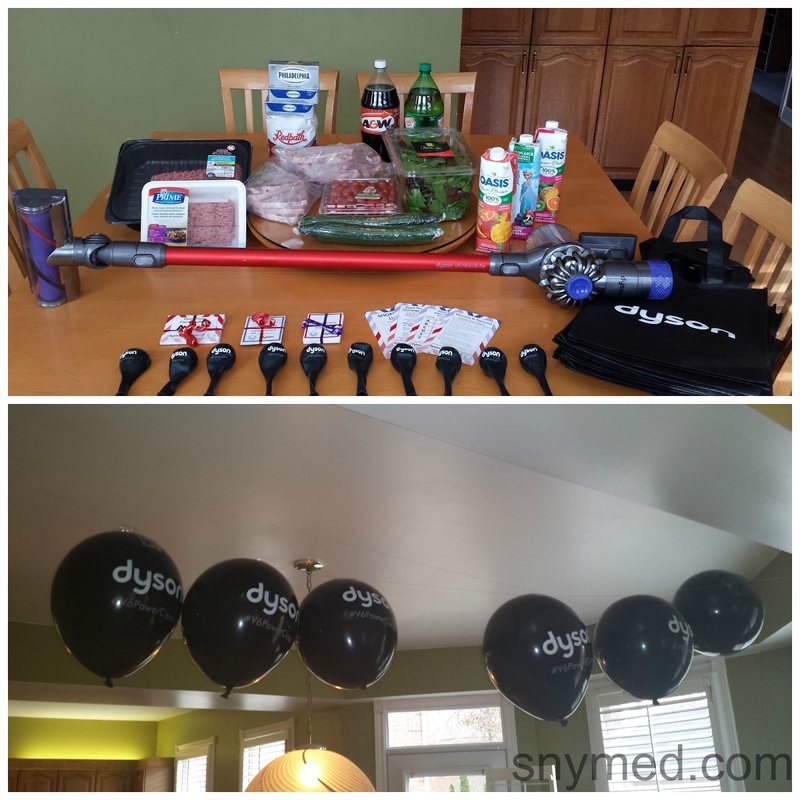 How great is Dyson sending you that cute purple vacuum for your son??!! I love that they did that! I don't have a Dyson but I'd love one!!! I keep hearing rave reviews about it. I have a small hand-held vacuum that I use regularly for cleaning up after the kids, but it has a small nozzle and limited vacuum time so it doesn't always do the job the way I'd like it to. My regular vacuum seems to have lost its sucking power so I basically only use it for the rug and sweep the rest of my floor. If it ever dies for good, I'm buying a Dyson. :) Thanks for sharing your experience! LOVE that this is cordless. So awesome that you can get a good clean without tripping over the power cord. Love how the Dyson handled cleaning up those chips! What a wonderful review of such an amazing product,i would love to invest in a product like this when my vacuum finally gives out !